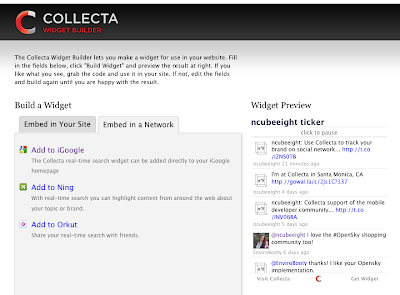 For bloggers interested in tracking world events in their blog posts, Collecta widgets can be tailored to follow specific Hashtags or keywords. The resulting stream will include results across all major blogging platforms and social networks for up-to-the-second tracking of the social discussion around an event. Below ticker is tracking current event news and commentary around the recent tsunami in Indonesia. Have you ever wanted to track mentions of your company brand across all the major social networks? Collecta enables you to search across Twitter, Facebook, MySpace, Yahoo!, flickr, YouTube, Google Buzz and 15 Million blog sources, location sharing services. This permits you to do a keyword search across all locations in one view. 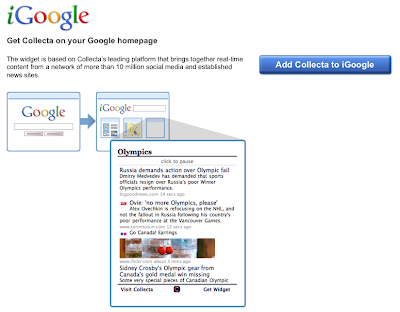 In addition to following real-time mentions in a web browser at www.collecta.com or on your phone's browser at m.collecta.com, Collecta enables a quick means to embed a widget in your iGoogle homepage. This enables you to passively monitor your mentions, tweets, content updates and buzz from one single screen. 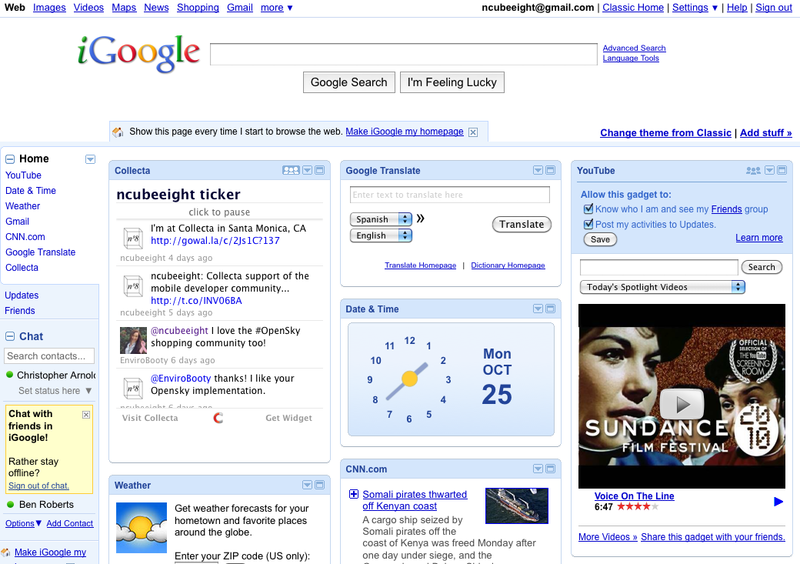 The screenshot left is a view of Collecta tracking ncubeeight across Gowalla, Blogger and Twitter as shown from my iGoogle homepage. This is an affordable way to track your company's reputation. 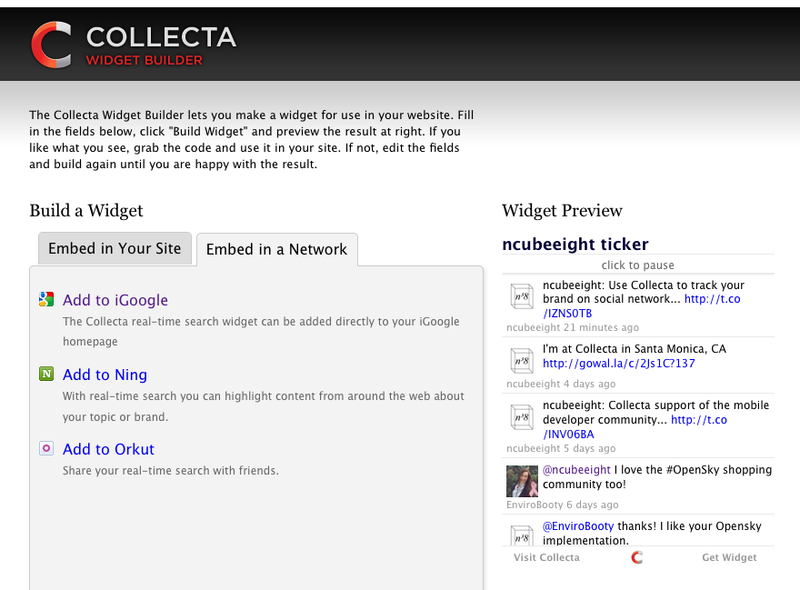 Steps to add Collecta to iGoogle are first to click on "Get Widget" from any one of our 80,000 publishers or go to widget.collecta.com and choose the "Embed in a Network" tab after entering your keyword. Once you select "Add to iGoogle" you will see a confirmation page. After your widget appears on your logged-in iGoogle page, you can reposition it, or add other widgets to track other topics with Collecta. Collecta has launched its mobile search portal for access on smart phones. Entering a keyword at m.collecta.com from your phone enables you to stream real-time results from across the web on any topic. Returning to your home-screen, you can easily toggle between previous searches stored by your phone to retrieve past streams. 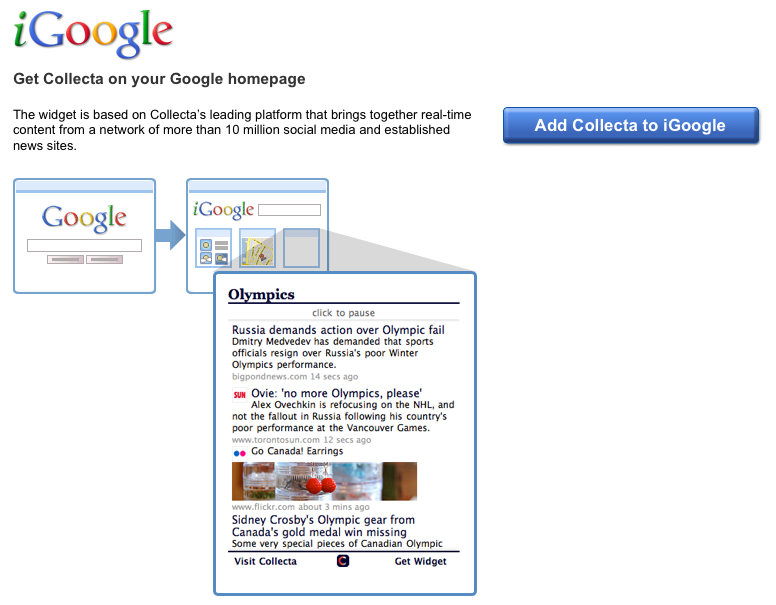 Collecta provides its APIs for mobile developers to integrate search results into their own apps. Please visit us at developer.collecta.com for details.